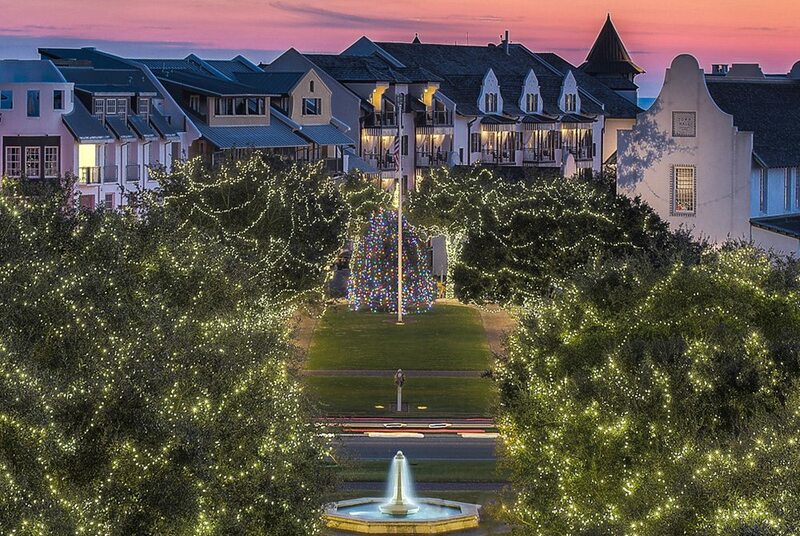 In Rosemary Beach, soft lights are draped through the trees. 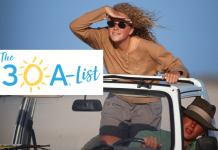 © 2014 Rosemary Beach Cottage Rental Company, LLC. ‘Tis the season for towns and neighborhoods coming aglow with twinkling holiday lights. 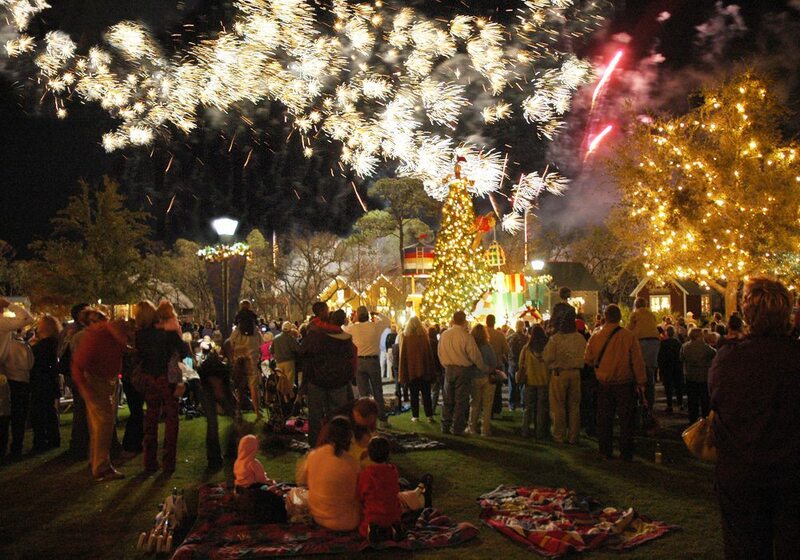 In South Walton, our beach communities pull out all the stops to dazzle spectators during the holiday season. 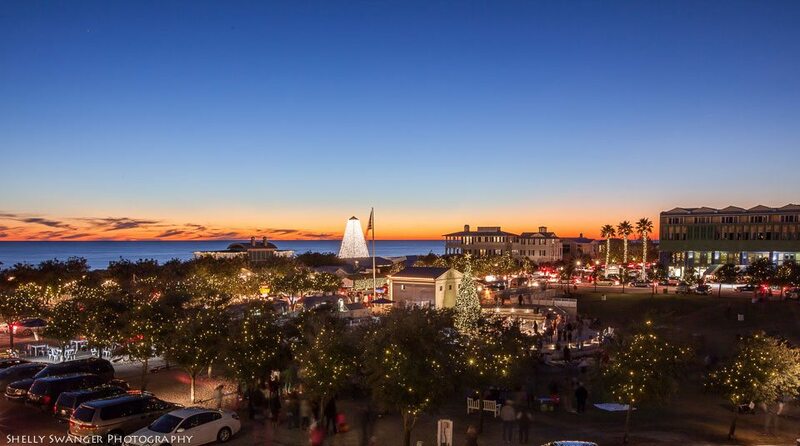 In the Rosemary Beach community, Christmas lights are draped in the oaks all along North and South Barrett square, giving the town a soft, magical glow. The highlight of the community’s holiday decorations is a 25-foot Norwegian Spruce set against the backdrop of Town Hall. Baytowne Wharf puts on a holiday light show several nights a week. 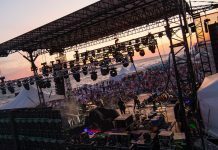 Photo by Sandestin Golf and Beach Resort. 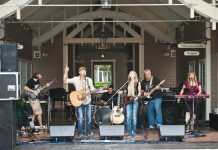 For the holidays, The Village of Baytowne Wharf really puts on a show — literally. All through the month of December, enjoy a fun, family-friendly light show over the lagoon set to some of the most beloved holiday tunes. 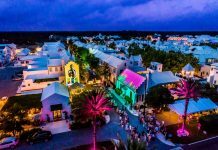 The show plays every Friday and Saturday night leading up to Christmas at 6 and 7 p.m. On Wednesdays, during holiday concerts at the plaza, the show will go off at 7 p.m.
A towering, 30-foot Christmas tree at the Alys Beach amphitheater is the centerpiece of this town’s holiday decorations. 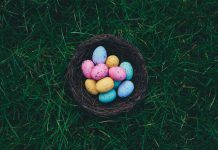 Don’t miss the sight of garlands hanging from each iconic buttery and crossing over Scenic Highway 30A. It’s the perfect spot for a before-sundown photo opp. Wreaths are also hang throughout the property and decorated trees are located at the Alys Beach Sales Center and Fonville Press. Grand Boulevard gets into the spirit with lights and decorations, the highlight of which is the Festival of Trees located in the center’s courtyard. Twelve beautiful trees have been decorated by area non-profits and will be on display through Christmas. 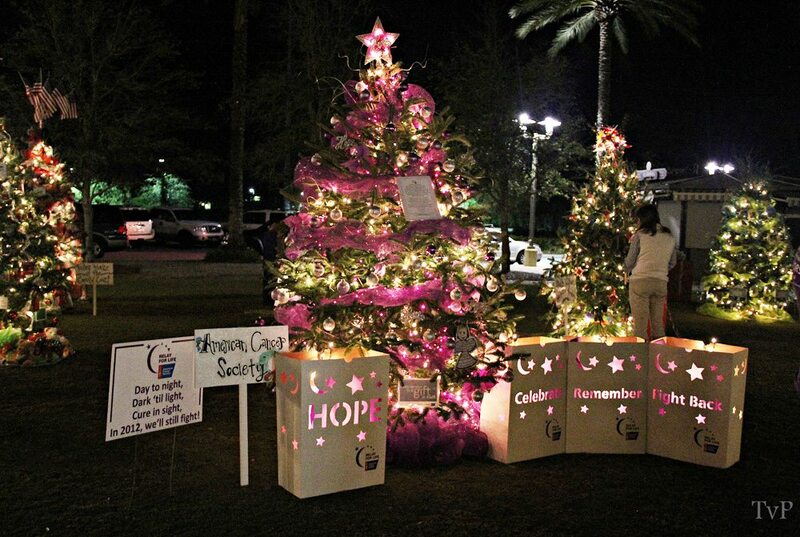 The American Cancer Society decorated this tree on display as part of the Festival of Trees at Grand Boulevard. Photo by Grand Boulevard. 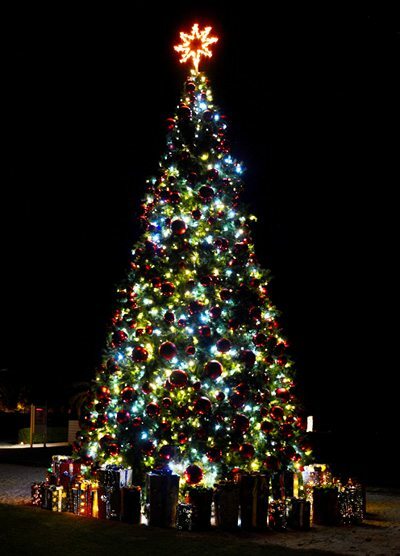 A 24-foot tree stands tall at the Seaside amphitheater and the entire town is lit up with twinkling holiday lights making this a perfect spot for a stroll to get into the holiday spirit. Looking fore more holiday fun? 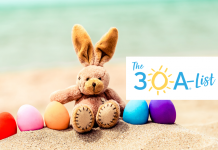 Check out out our 30A Guide to the Holidays.